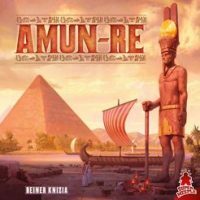 Amun Re is a game for 3-5 players involving strategic planning for later rounds, evaluating different aspects for value to opponents and oneself, and bidding accordingly. Generally it will take 45 -75 minutes, depending on number and experience of players. First I will do a game overview, then a round overview, then will speak a little on my thoughts. The map displays a section of ancient Egypt along the Nile that contains 15 provinces, each with unique strengths and weaknesses. During the game there are two halves – during the first half of the game each player will build up civilizations and pyramids on 3 provinces each. This represents the “old kingdom” time period of ancient Egypt. After the first half of the game, he players are scored on their work and everything is wiped away…literally. Anything a player adds to a space will be removed from the board, with the exception of pyramids and their building stones. Next begins the second half of the game, representing the “new kingdom.” Players essentially start over and do the same thing, which is less repetitive than it would seem as there is one significant difference: in games with less than the full 5 players, the provinces available to the players at the beginning of the “new kingdom” may NOT be the same ones they could choose from the first time around, and there is no guarantee they will claim the provinces they owned in the first half. In the second half you start with whatever money you made in the first half of the game, so not everyone is on the same level. Many provinces will already have pyramids on them, making them significantly more valuable and sought after, as well as ramping up the level of competition. After the buildup of the “new kingdom”, the game ends and is scored. Players start the game with 20 gold (in the form of cards), as well as a (-3) gold card (explained later) and a pyramid building power card. The first player takes the starting player token (a cardboard pharaoh), and the cardboard temple sacrifice token is put on the sacrifice track at the top of the board. The board is comprised of said temple sacrifice track at the top, the Nile running straight down the center of the board, and the 15 provinces (7 on one and 8 on the other side of the Nile.) With the province cards ready nearby, the game is ready to begin. After the province cards are shuffled, deal out a number equal to the number of players (in a 4 player game, deal out 4) into a common area. These are the provinces available this round. Each card has a “bidding track” with set, increasing bid levels (starting at zero) running around it. The bidding begins with the first player, who places his colored marker on the province of his choice at his selected bid level. This continues in clockwise order with each player selecting to bid over the player(s) on a current card or to begin bidding on a card that has not yet been bid on. At the end of one round of bidding, if all player markers are on different cards, bidding ends and players pay for their provinces according to their bids. If this condition is not satisfied, bidding continues in turn order, with each player who had been outbid now choosing to bid again. Players bidding again can NOT place their marker to outbid the player who outbid them (they cannot re-bid on the province they were outbid on). When all players have claimed provinces (the last province can always be claimed for free), they each place a token of their color on the board in their new province. The next phase is the action phase. In turn order, players purchases and places farmers, buy (and may use) power cards, and purchase building stones/pyramids (three building stones can be used to form one pyramid). The first of each type of item (stone, card, farmer) costs 1 gold, with each successive item costing 1 addition gold than the last unit ( 3 farmers could cost 6: 1 for the first farmer, 2 for the second, and 3 for the third) In this way, 3 farmers, 2 cards, and 4 stones would cost the player 19: 1+2+3+4 = 10 for the stones, 1+2 = 3 for the cards, and 1+2+3 = 6 for the farmers. The chosen provinces determine to some extent what each player may purchase in a given action round. Each province will contain (or lack) any number of spaces in which a farmer may be placed and a number of power cards (or none), among other things. These two aspects of the provinces are important now: the number of farmer spaces available in a province determines the maximum number of farmers a player may purchase and have in that space, while the number of power card icons in a space allows you to buy only that many power cards per turn. A given space can hold any number of pyramids and/or building stones, the only limit is what a player may afford. In addition to the power card icons and the farms, provinces also MAY contain a combination of temples (which give a variable number of points at the end of the old and new kingdoms, set income (denoted by a gold coin with a number inside), drought only income (denoted by gold with a picture on a camel nearby), and in some cases contains free items the winning bidder immediately receives on claiming a province, such as gold, power card(s), or building stone(s). It should be noted that players do not have any ability to buy power cards apart from the privilege given by provinces. Also, the power card purchase privilege does not stack over the course of a game a player who claims a first province that allows the purchase of 3 power cards, and then claims a second province card next round that gives the ability to purchase 2 province cards STILL possesses the ability to purchase 3 power cards. The privileges do not stack. If, during the last round of the old kingdom the player acquires a province that allows for the purchase of 4 power cards, he/she can now purchase only 4 power cards in the action phase that round. After the Action phase comes the Sacrifice phase. The collective amount of sacrifice determines how fertile the land is this round. Players choose secretly and simultaneously what amount of sacrifice they wish to contribute. Players (as noted at the beginning) are provided with a (-3) gold card. They may choose to sacrifice the (-3) card or any number of gold from their hand (the -3 card is played alone, and represents stealing from the sacrifice). Players place their sacrifices face down in front of them, holding their hand over them so other players cannot see the number of cards chosen. Players simultaneously reveal their cards and tally up the sacrifice. The temple sacrifice track at the top is divided into 4 sections, each representing a different level of sacrifice. Level 1=2 or less, Level 2=3-12, Level3=13-22, Level 4=23+. Level 1 represents extreme drought, while level 4 represents plenty. On the track levels 1 and 2 have a picture of a camel on them, while levels 3 and 4 do not. The total number of gold (add all sacrifice gold, subtract each (-3) card presented = total sacrifice. Let’s assume that in a 4 player game, player 1 sacrifices 5, player 2=3, player 3=6, and player 4=(-3). 5+3+6 = 14 minus the (-3) = 11. Move the temple to sacrifice level 2. The player with the highest sacrifice claims 3 rewards in any combination of building stones, farmers (assuming their province’s farms are not full), or power cards (which may be claimed regardless of province limits). The second player claims 2 rewards, and the rest of the players who did not play the (-3) claim one reward. Ties for position are resolved clockwise from the starting player. Finally, any player(s) who played a (-3) collect 3 gold from the bank. In the Harvest phase players take gold for each of their farmers. All farmers produce 1 gold each per level of sacrifice. With the sacrifice at 2, each farmer produces 2 gold for its owner. Provinces with no farmers and only a numbered symbol of gold on them provide that number to their owner, such as (8). Provinces with a gold symbol with a number in it, such as a (7) with a camel next to it only produce their gold in drought years (sacrifice levels 1-2) so in this example those players would claim their gold…this time. Players play 3 rounds per kingdom, claiming an additional province each round. After these 3 rounds the old kingdom is scored. The new kingdom follows with 3 rounds of its own, and then it is scored as well. Players are scored first based on the number of pyramids (1 point each). Next players are scored based on sets of pyramids, defined as one pyramid on each of your provinces (3 points per set). So, a player with two provinces containing 2 pyramids each and their third province containing 3 pyramids would get 7 points for the pyramids (2+2+3) and 6 extra points for her sets (3+3). The player with the largest single pyramid on per side of the river (the largest pyramid on the east side, and then the largest pyramid on the west side) get 5 points each. Ties are resolved by the pyramid with more building stones and further ties gain equal points. Players add in any bonus power cards they may have collected. Some examples are: having all your provinces on the east or west side of the Nile, having all your provinces in the north or south, and having at least 9 farmers between your 3 provinces. Each bonus card which you own and whose requirements you fulfill will gain you 3 points each. After the scoring of the New kingdom the game ends. The player with the most points is the winner, with ties being broken by most pyramids and further ties broken by most building stones. If there is still a tie, the tied players win. I really feel like Amun Re does well with its theme. There are some mechanics that really don’t make sense, such as the sacrifice, without the theme. The artwork is good, and while it does add to the theme, most of it is really there purposefully, such as the camel being present on the temple track on both the first and second sacrifice levels to remind players only to claim the province’s camel gold in drought years. Neither the power cards nor the board have any text on them (other than province names) so once players know what the pictures mean (easily done in one game) and the rules, there is practically ZERO in-game text dependency. The pictures are all very descriptive, as well, more easily lending themselves to the fact that there isn’t text. I really don’t feel like this is one of those games that suffers from a certain number of players. With 5 players there potentially will be more competition, but with fewer you may not see the same provinces between the old and new kingdoms. There does seem to be a distinct advantage of experienced over new players. There isn’t a bad learning curve for the mechanics at all, but most new players will probably do pretty badly the first time around just with strategy. I certainly did badly my first time through, despite having an experienced player who I could model play after. After the first couple games the strategy really evens out and things become competitive. Overall, Amun Re has good theme, good mechanics that go well with the theme, and good depth and strategy for its length. Amun-Re takes place in ancient Egypt. Players take on the role of wealthy land owners. Players will acquire provinces, build pyramids and obtain farmers in an effort to build prestige. The theme is somewhat represented in the game. The object of the game is to develop provinces by building sets of pyramids, obtain temples and collect gold to score the most victory points (VPs). Amun-Re is for 3 to 5 players ages 12 and up and plays in about 100 minutes. I would recommend Amun-Re for 4 or 5 players. The components are very good. The board is mounted on thin cardboard and colorful. There are thick cardboard tokens and ceramic playing pieces. The small size cards and summary sheets are marginally durable. The rulebook is 11 pages and well written and organized, and contains many examples of play. Overall the artwork is done well and sets the theme. Set-up for Amun-Re is quick and easy. Each player receives a summary sheet, two player markers & three province markers in his color, one Builder Power Card, and twenty starting gold. The province cards are shuffled and the temple stand-up placed on the board. A starting player is determined and given the Amun-Re figure and you’re ready to play! Draw province cards equal to the number of players and place them in the corresponding province on the board. Players acquire provinces through a bidding mechanic. In turn order, the players place their player marker on a numbered space on one of the province cards on the board. Once all players have placed their marker (bid) any players outbid must rebid. He cannot rebid on the province he was just outbid on. There are some Power Cards which allow a player to rebid on a province or block players from making a bid on a province. When bidding is complete, each player pays the amount of gold to the bank, discards the province card and places his marker on the province. Players also collect any free power cards, farmers or stones the province produces. This phase is the heart of the round. Each player in clockwise order may buy Power Cards, Farmers, and Building Stones. One item of a kind costs 1 gold, 2 items of a kind cost 3 gold, 3 items of a kind cost 6 gold and so on according to the price table on the board. For example during a player’s turn, he may buy 2 Power Cards for 3 gold, 1 farmer for 1 gold and 5 stones for 15 gold for a total of 19 gold. Power Cards grant the player a special bonus, such as gold, VPs, or farmers. Purchased Power Cards may be used immediately or saved for another round. There is no limit to the number of Power cards a player can have in his hand. A player can discard a Power Card at any time for 1 gold. Farmers earn players gold during harvest time. They must be placed in empty farm slots in a province. Building Stones are used to build pyramids. It takes three Building Stones to build one pyramid. Building Stones are also immediately placed in a province. In this phase, a sacrifice in gold is made to the King of Gods, Amun-Re. The size of the sacrifice will determine the size of the harvest to follow. Each player secretly chooses an amount of gold to sacrifice and then reveal their sacrifice simultaneously. Amun-Re rewards the highest sacrifices with Power Cards, Farmers and/or Building Stones. The player that offered the highest sacrifice can choose any 3 items. For example, two Building Stones and one Power Card can be selected. The second highest sacrifice receives any 2 items. Other players who contributed to the sacrifice receive 1 item. The total amount of all player’s sacrifice is compared to the temple track on the board. The temple stand is placed on the corresponding total sacrifice value. For example if the total sacrifice was 11 gold, the temple would be placed on space 2 of the temple track which has a sacrifice range of 3-12. Each player receives gold equal for each of his farmers. The value of the harvest is the number of farmers times the value depicted on the temple space with the temple stand. For instance if a player has 10 farmers on his provinces and the temple stand is on space two, the value of the player’s harvest would be 2 times 10 equals 20 gold. Players also take any additional income that their provinces produce. Each temple the player controls. The VPs depend on which space on the temple track the temple stand is on. If it is the end of the Old Kingdom, then all provinces markers and farmers are removed from the board and players begin the New Kingdom. If it is the end of the New Kingdom then the game is over. The winner is the player with the most VPs. Amun-Re is an easy game to learn and play. I would consider Amun-Re a medium weight game and would not recommend it to casual gamers. Similar to most Eurogames, there is some planning to do; however, the planning in this game won’t melt your brain like many Euros. Amun-Re features above average player interaction for a Euro. Obviously the auction in the Acquire Provinces phase has heavy player interaction, and this intensifies during the New Kingdom because provinces with pyramids are at stake in the bidding. Players also interact when determining their sacrifice to Amun-Re and can also influence the size of other players’ Harvest too. I’d like to point out that there are no cubes to push in this game! Instead, players race to build the most pyramids. Most info in the game is open knowledge but there is just enough to always cast doubt on who is in the lead due to hidden gold and power cards. Amun-Re is an older game but has withstood the test of time. It is a fun game with a different feel from most Euros and would be a good addition to your collection. This was the first game I played when I realized the genius of not having dice or random factors in a game, or at least very very little randomness. It is a game that changed the way I saw board games and for that it will always have a special place in my game collection. Players start each round by bidding on lands (drawn randomly and placed on the board) by placing bid tokens on the different lands. The auction ends when no one is competing for the same land. The bidding works by placing you’r bid token on a number on the land and the next player may then place a bid token above that token, when it is you’r turn again you can not bid on the same land again. The auction portion is about picking the right amount of money to get the land you want the most, not all lands are created equal after all. Bid to low and you might lose or be outbid, bid to high and you might use to much money. After each player has a land you all take turns building either a) pyramids b) slaves or c) chance cards. Pyramids is the main way of getting points, but there are many others. Slaves give you money at the harvest. Chance cards give you either money, bonus point conditions or actions to use in the bidding phase. All resources are important and useful, purchase wisely. After everyone has done their purchasing it is time to sacrifice gold to the god Amun-Re. The sacrifice decides how much money each slave gives in return, if lands with camel symbols get extra money and finally how many points lands with tombstone symbols will get. The winner also gets a prize from Amun-Re in form of 3 freely selectable goods (pyramid stone, slave, card), second place gets two, all who gave gets one and those who steal from the sacrifice (-3 bid) get 3 gold. These three phases repeat until all lands are taken and developed. Then there is a scoring after the third sacrifice to Amun-Re. Then the fun begins. The old-dynasty now dies away and all land is freed up. Now players will bid on the same lands as before with one crucial detail, the pyramids from the old-dynasty are still standing there, up for grabs. This changes the auction phase a lot. After another three phases there is a final scoring and the game ends. All these phases have different tactics and different considerations to think of, making the game very varied from phase to phase. Yet only the player who masters all phases in a grande scheme (from 1 to 3 and then the new dynasty) will win the game. A brilliant game in both design and execution that I am always wanting to play just one more time. If you’re familiar with Reinder Knizia you’ll know what type of game this and that it includes biding. Fairly simple fun game that has you bid for areas that you will own for one phase of the game and then bid again later for the 2nd phase of the game. Each area can be build up with pyramids for victory points or workers to gain money and also allow for other bonuses such as ability to buy certain number of cards, bonus building materials for pyramids, bonus money at the end of the round, or bonus victory points at the end of the 2 phases. Each area has its up sides which some players may want to bid on to get where others may not find value in them. There are 2 phases in the game and each phase consists of 3 rounds. A player takes his turn by buying cards (up to their max based on the areas they own), buying building materials, and buying workers. Cards give the players bonuses on victory points or coins and also reduction cost to build pyramids and free workers. At the end of each round a sacrifice must be made in currency. Each player chooses how much or little they want to give in secrecy. Then once everyone is ready they reveal at the same time. The player who gave the most gets to choose from a number of items (cards, materials, workers) and then the next highest chooses from a lesser number of items. Bidding low does have its advantages though because there is a 4 tier sacrifice system that can boost coin gain or victory point gain based on how much was given in each round and keeping that low may be a priority to you. At the end of first phase players add up victory points based on number of pyramids in an area total number of pyramids and so forth including bonuses from cards. Then every player relinquishes control of each area and workers are removed but not pyramids. Then the players enter phase 2 where they bid on each area again and finish the game scoring the same way at the end of the 2nd phase. Add a Review for "Amun Re"